I know a lot of my Weekend Cooking posts are about seafood. I'm lucky to have a wide variety of fresh fish and shellfish available at Wegmans and we routinely eat it at least a couple times each week. During the summer months, it's mostly grilled, but a recent streak of rainy evenings sent me back into the kitchen. 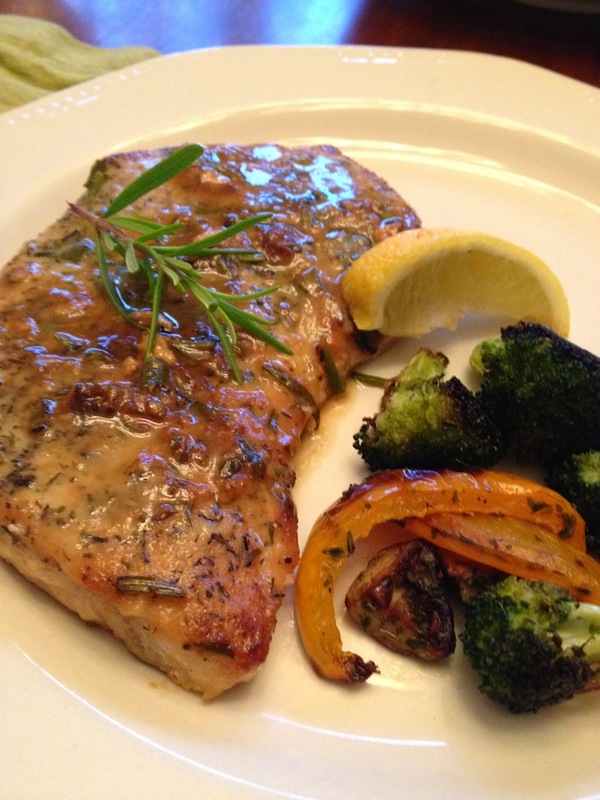 With fresh swordfish in the refrigerator and grilling no longer an option, I turned to Pinterest for ideas and found a recipe for Seared Swordfish with Lemon and Rosemary Wine Sauce at Simple Comfort Foods. Pan-searing is, without a doubt, my favorite technique for cooking seafood indoors. It's quick, easy, and I love the slightly crisp, flavorful crust it produces. With basic ingredients on hand and fresh rosemary and thyme just waiting to be picked from my herb garden, selecting this recipe was a no-brainer. This dish was outstanding - definitely as good as anything from my favorite restaurant. The recipe can be found here. To learn more about the technique, here is Wegmans Pan-Searing Seafood video. It's 4 minutes well-spent even if you're a pan-searing pro! 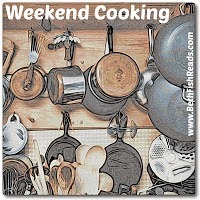 Pan-searing can also be used to cook chicken and meats... and Wegmans has videos for that, too. In fact they have, the have a variety of videos on various cooking techniques as well as specific recipes. Even if there isn't a Wegmans in your area, you can still check out their YouTube channel. Do you ever watch cooking videos on YouTube? Any favorites to share? Kathy - Everyone loved it here! Diane - I'd eat this every week! Pan searing is my absolute favorite way to cook too! So much deliciousness! Your dish looks very yummy! Athira - Pan-searing is the best! This recipe was so good. Teddyree - Pan seared scallops are my husband's favorite. Hope you like this recipe! I wish I was more adventurous when it comes to seafood. The only thing I've eaten a lot of is shrimp and I developed an allergy as an adult so I can't eat it anymore. Since I don't know what I'm doing I'm always hesitant to try seafood. Your Swordfish looks amazing! Pan searing is my go to way to cook most meats when I'm short on time. Katherine - I bet this recipe would be delicious with chicken, too. Might just try it this week! I dont think I have ever had swordfish... sounds yummy! I love searing food and that swordfish looks amazing! Thanks for including the video. I have been cooking a lot this summer, especially using all the great produce from the farmer's market! Sunday - That swordfish recipe was so simple and delicious... especially with fresh veggies. I've had more time to cook this summer, too, and love visiting a couple different farmer's markets during the week. This sounds fantastic! I would give anything for a Wegman's but we don't have those here. :( Although I am in Florida and have easy access to seafood. I agree with you about pan-searing. Its my favorite method as well, especially for salmon. Thanks for sharing this recipe! Lisa - We spent a good part of the winter in Florida this year and I loved every minute, but was so happy to shop at Wegmans again when I got home! Haha! I feel like I could have written this post! Most of my Weekend Cooking posts are about seafood as well and pan searing is also my favorite indoor seafood cooking method :) I usually marinate swordfish in lemon, olive oil, rosemary, and garlic before grilling...this wine sauce sounds like a fantastic indoor substitute. I'll have to give it a try. Thanks for stopping by today! Sarah - This recipe is definitely a keeper! I think the fresh herbs made all the difference. Carole - I'll definitely be preparing this meal again! This looks so good! And I totally agree that Wegmans not only has great fish but wonderful resources. I haven't used their videos enough. Thanks for the reminder. Beth F - I've watched several of Wegmans videos. They're well done and informative! My family does not like fish and hates when I cook it for myself so fish is usually not on the menu, but I love it. Ti - I know how that goes. I love omelets and frittatas, but my husband won't eat them, so we never have it.